On November 9, 1936, American Ruth Harkness found a giant panda in the bamboo forests of central China. Following the discovery, she would go on to become the first person to bring the endangred species out of China alive. Harkness was by no means the explorer type. Before she came to China with her husband Bill in the 1930s, she was a chain-smoking, heavy-drinking socialite and dress designer in New York City. 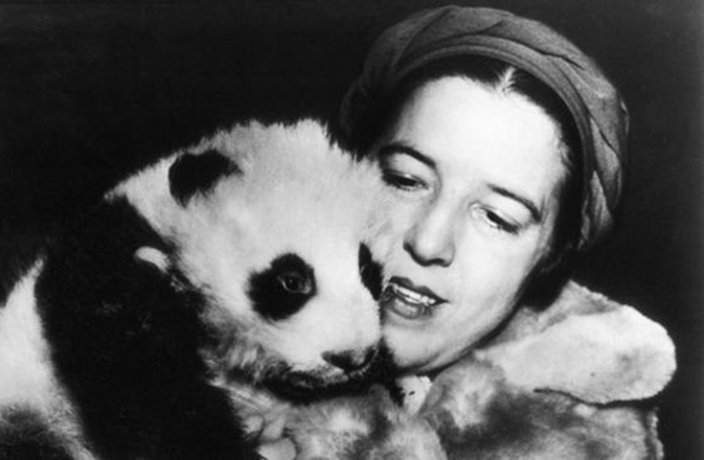 Following the death of her wealthy husband from throat cancer in Shanghai in 1936, Harkness made it her mission to fulfill his lifelong dream of bringing a panda back to the United States. Left with a small fortune, the 35-year-old new widow traveled to Shanghai alone to complete the panda-hunting mission. It was quite the mission for someone who "wouldn't even walk a city block if there was a taxi to be hailed," as author Vicki Constantine Croke wrote in The Lady and the Panda, a 2006 book about Harkness' incredible adventure. Once in China, Harkness met a handsome Chinese college student named Quentin Young, who had once helped former US President Theodore Roosevelt find a panda in China a few years prior. Together with Young, they left Shanghai on September 26, 1936 on a steamer, making their way towards Chengdu in Sichuan province. Once in Chengdu, Young led a team of hunters, cooks and coolies as they made an expedition across the rugged mountains of the Tibetan highlands. The caravan grew to as large as 23 people. "I don't know whether it will be humanly possible to get a panda or not, but I feel that if it is, I will," wrote Harkness in a letter to a friend back home in the US. "After all my dear, there probably aren't more than three white people who have ever seen one and no-one knows his habits or what he eats, or anything about it." The group traveled on foot, going as far as 30 miles in day. Despite her socialite past, Harkness adjusted surprisingly well and over the next few months, she and Quentin began an affair. Following months of trekking, the group finally arrived at the bamboo forests in November, where they decided to set up camp. After just a few days, they encountered a nine-week-old panda cub hiding in a tree. She grabbed the cub and cradled it in her arms, nursing it with a baby bottle. Harkness named the panda Su Lin, after after Young's sister-in-law. The name meant "a little bit of something precious." Harkness brought Su Lin back with her to Shanghai, where she was promptly mobbed by reporters. From there she tried to bring the cub back to New York, but was nearly thwarted after customs officials confiscated Su Lin at the docks. Unwilling to part with Su Lin, Harkness let the ship sail without her, staying in customs all night until the animal was released. She was able to get Su Lin out of the Middle Kingdom listed as a dog. Upon arrival, she became the first person to bring a live giant panda to the US. The media circus followed Harkness to New York, where she became a press sensation as reporters were eager to find out more about the first giant panda to arrive in the West. For the first few months, Harkness kept Su Lin in her New York City apartment while she looked for someone to buy the cub. Nearly broke at this point, Harkness eventually offered Su Lin to the Brookfield Zoo in Chicago in exchange for USD14,000. Su Lin would end up becoming the star attraction, drawing in more visitors than any other animal in Brookfield Zoo's history. A year later, Harkfield traveled to China again to bring another panda, Mei Mei, to the same zoo. Sadly, Su Lin died of pneumonia shortly aftewards. Mei Mei later died in 1942. Harkness made a third trip to China, but didn't bring a panda back from her final expedition. She later wrote a biography about her journey, also entitled The Lady and the Panda, in 1938. Unfortunately, she passed away in 1947 at the age of 46 from the effects of alcoholism. But Harkness' legacy lives on, and today the giant panda is one of the most revered and closely protected species on the planet. For more history stories, click here. Believed to be the first time British and American forces fought as allies in a land battle. The Shanghainese silent film star had taken her own life at the age of just 24. The 'wedding cake' still stands today with a Soviet star atop its gilded spire.